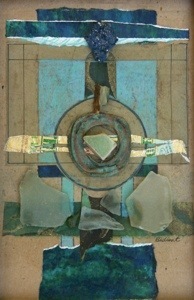 This collage/assemblage was made in England. It had it all; things picked up on the beach, paper bags from the shops, colored paper towels from the loo, and even a strip of metallic butter wrapper. It’s one of my very favorite pieces.